Win free DESK space for your business! Are you a running a business from home? Are you looking for an extra boost of motivation, inspiration and source of growth but can’t find it within your own four walls? What you need is some cross pollination of ideas across industries, professions and skill sets which creates exciting new opportunities to solve problems and reimagine solutions to customer needs. Would you believe this is happening right here in Coffs Harbour? You can see this in action on the first Wednesday of every month when Coffs Harbour’s co-working hub Six Degrees hosts The Pitch. One of the members gets the opportunity to pitch their passion in five minutes which is followed by a panel of experts and members of the audience providing ideas, solutions and questions to help grow that passion into a blossoming business venture. Frequented by people from a diverse array of backgrounds, Six Degrees is a melting pot of ideas, unlike any traditional office. One day you might sit next to a banker and the next day a graphic designer, a travel writer may join you for lunch and an app developer invite to you help them solve a problem. This diverse mix of expertise buzzing in a single space is where the magic happens. Coworking has become so popular in Coffs Harbour that in addition to the Tuesday Coworking sessions held at the Community College space in the City Centre, 6 Degrees has expanded to the offering to five days per week at the Innovation Centre at the CHEC campus. 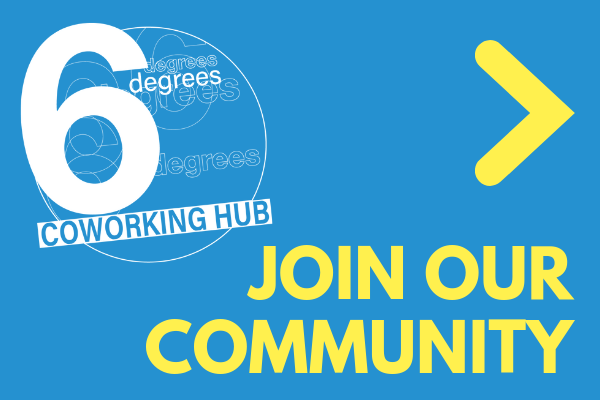 To celebrate this expansion 6 Degrees @ the Innovation Centre are giving a couple of local entrepreneurs the opportunity to win 3 months free coworking (2 days per week) by simply stating in 100 words or less why they think their business would benefit from coworking. That is a boost to your business worth $300! Entries close 14 March 2016. ENTER HERE by telling us why your business would benefit from hanging out in our coworking space? I am interested in entering the contest to win free desk space, however the form does not seem to be working properly. Are you able to register my interest for me? I quit my job 10 months ago and took a leap of faith. I want to create a work life that is meaningful to myself and beneficial to others. As such, I have created my website to raise money for charity and NFPs. I have learned so much and I am proud of what I have achieved. I still have much to learn with respect to social media and marketing, with managing my website, CRM and much more. It is overwhelming at times. Fresh perspective, skills and ideas would be a very welcome boost for the continued growth of my business.